ASPCA personality Type: Constant Companion – Let me sit at your feet, walk by your side, and I’ll be your devoted companion forever. Abraham is one handsome mofo. He is easily the most beautiful person in our household, but he doesn’t let it go to his big, manly square head. 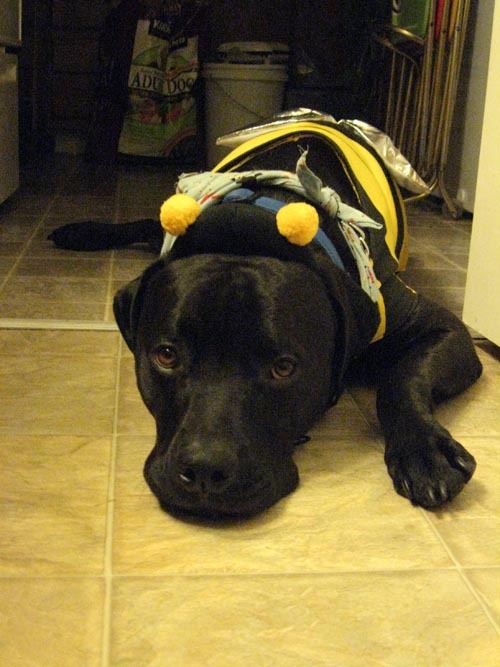 Also, sometimes he’s a bumblebee. The only people that Abraham doesn’t like are people in wheelchairs and weirdos. Also, he humps puppies…so maybe he needs to stop and reflect on who the actual weirdo is. This guy can sit pretty! He’s pretty much the greatest.